Despite the chillier temperatures today, we spent the entire day outside. In the morning, we went to the Arboretum, where we looked for two geocaches (for those of you looking for ways to motivate little people to go hiking, this is definitely a winner!) and marveled at the daffodils and forsythia. I also found these delicate white flowers; I'm not sure what they are, but they were irresistibly fluttering in the breeze. And in the afternoon, we went to our local park. In between, while Ian was napping, I went for a run, and then took a ride to Stockton, feeling like I wanted to take more pictures, and like I wanted to visit the farmers' market. I love Prallsville Mills. The complex, built in the late 1800s on the same footprint as the early 1700s grist mill, is now a center for arts and community programs, which can be rented out for events. Oddly enough, Steve and I were considering having our wedding reception here, long ago, before we had any idea that we'd ever move to the area. Today, they were having an art show, and there were some forsythia in the window. It seemed so simple and quaint, but so elegant at the same time. The Farmer's Market was fairly quiet today; the vendors I talked to speculated that it was because of the weather. Even though it was cold, everyone wanted to be outdoors in the sun. There were hydrangeas at the door today, in preparation for Easter. The Milk House was selling some beautiful greens and hydroponic organic lettuces. Though I didn't buy any today, I couldn't resist photographing them. They also had some purple potatoes, which the vendor kindly cut open so that everyone could appreciate their stunning color. The vendor kindly cut open so that everyone could appreciate their stunning color. I was also admiring the mushrooms, having eaten an amazing salad while I was in Philadelphia this weekend, of spinach and sauteed mushrooms and goat cheese. Spring is definitely coming, and with it the promise of regular installments of fresh local produce. I'm so looking forward to it. And in the meantime, dream of fresh chopped salads like this one, that we ate for dinner tonight. The first chopped salad I ever ate was in Los Angeles, oddly enough, at a chain restaurant; I can still remember how fresh it tasted, how the flavors all mingled together, and how it practically leapt into my mouth. The wonderful thing about chopped salads is that you can put pretty much anything in them (even beans or chick peas), and kids tend to like them because everything is bite-sized, and colorful, and fits well into mini whole wheat pita pockets. Chop everything into small pieces, and grate the mozzarella. Toss together in a large bowl with oil, vinegar, oregano, basil, salt, and pepper to taste. I don't know about you, but I am ready for spring. I remember, growing up, embarrassed, watching my mother touch the trees and croon to them, thinking that she was certifiable. 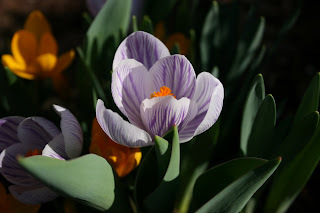 And wouldn't you know it, just the other day, coming back from a run, I found myself inexplicably drawn to a budding branch, some mottled tree bark, a patch of purple crocuses. I had to touch them. It was like I needed a physical connection with the life force that was surging through the natural world, starting over. When I came home today, I found this in the garden in front of our house. Though I didn't run my fingers over the delicate petals this time, I immediately ran in and grabbed the camera. Hooray for light, and new life! The students were back from Spring Break this week, and my Intro to the Thesis class dove right into syntoptical reading and concept mapping. Or rather, I threw syntoptical reading and concept mapping at my class, and they struggled admirably with my vague direction. Of course, I brought cupcakes. But these contained an important lesson for them today, about failure, and moving forward, and changing plans. All important considerations for naively optimistic youth about to embark on a major project with no predetermined path or certain goal. All important considerations for a baker. Or someone trying to get pregnant. Actually, for just about anyone. Behold, the carrot. Lowly root vegetable. Amazing how adaptable and accommodating they are, isn't it? They are happy as a side dish, as a main course, as breakfast, as snack, as dessert. I had a few left over from a curried chopped vegetable salad from the White Dog Cookbook (which I unfortunately did not photograph; it's such a cheerful dish, full of bright and bold colors) that I'd made earlier in the week, and I wanted to use them before I left for my conference tomorrow. 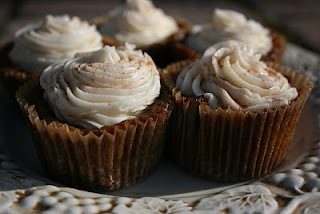 The first time I made this recipe, a few months ago, I'd attempted mini-cupcakes. I was making them for a special event, and there were going to be a lot of people, so I thought bite sized might work better. 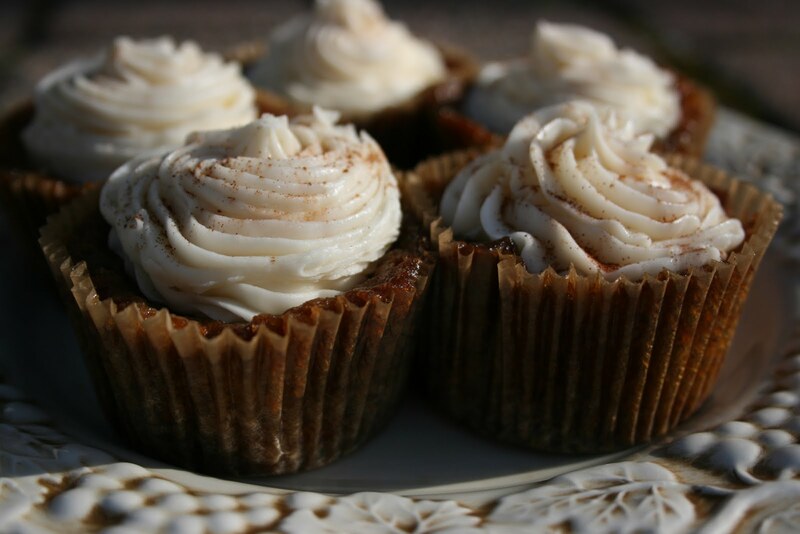 Much to my dismay, they sank; I opened the oven to discover little concave carrot cake hollows, which I later filled with frosting, treating them like tart shells, and telling myself that frosting hides a multitude of errors. Luckily, the people I was serving them to have low standards, and were appreciative nonetheless. I was convinced that doing them as standard-sized cupcakes would solve the problem, and set about mixing batter late last night. When the timer buzzed and I opened the oven door, though, my heart sank. Concave tart shells, again. I mixed up the cream cheese frosting, and did what I did last time: piled the frosting on, starting as filling and ending up as a topping. When I got to class today, I told the students that the cupcakes were an experiment. That they tasted pretty good (Steve had done quality control for me), but that they didn't come out as I'd planned. But that I had a deadline (our class meeting), and so I cleaned them up as best I could, and knew that I'd be going back to the kitchen to try again next week. I reminded them that they, too, would have weeks of partially (or fully) failed experiments next year. And that they'd probably have to show some results to their advisor that they were not entirely proud of, even having tidied it up as best they could. But that they should feel confident about heading back to the kitchen to try again, having learned something in the process. That maybe they'd have to change the way they were collecting data, or doing the analysis, or maybe they'd have to toss out the recipe entirely and start over, but that they'd be better for it. That it's OK to re-tool, to change plans, to be flexible. And that maybe the best results are sometimes the unexpected ones, the ones you're not even trying to get. That failure doesn't really mean failure. I think they thought I was a little crazy. They peeled the wrappers off and ate. As for me, well ... I'm not posting the recipe today. Though they are lovely to look at, especially in the spring sunshine, I'm going back to the kitchen on this one. Bicycle Built for Two: the "Life" Part of "Half Baked"
Spring has arrived in NJ. I have no beautiful food pictures today, because we spent the weekend clearing out the garden (digging for worms, really), coaxing the raspberry canes out of where the arugula will be, fixing up the barn, egg hunting, running, attending a silent auction for our new charter school focused on sustainability (where I won 10 classes to the yoga studio I frequent--hooray!) and trying out Ian's new "ukacycle" (his word, not ours). Now, before you scold me ... yes, we do make him wear a helmet. This was a "test run" of about ten feet, to make sure that he was actually going to be able to balance on the thing, and that I was not going to topple over. But what I really wanted to say is: right here ... this -- all of this -- is joy. Every day should be this amazing. Then again, if they were all like this, maybe we'd never know just how amazing they are. So what am I doing on the list? I had a picture perfect first pregnancy, but other losses since then, and was recently diagnosed IF by my OB/GYN. We haven't yet decided what road we will travel next ... and so this blog is a mix of recipes, musings about working momhood and my son (whom I call "my best gift"), coping with the baby boomlet happening around me, and my own decisions about the future. 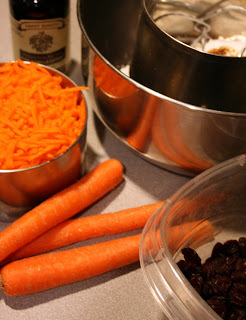 Some days I'm not sure which "blogosphere" I belong in ... but here's a good post to start with, if you're trying to figure out what this blog is anyway: http://ahalfbakedlife.blogspot.com/2010/01/for-health-healing-and-hope-carrot.html. Right about now, you're thinking, "wow, this woman makes a lot of cupcakes. It's a wonder she doesn't have diabetes." I had a good excuse, though. For the past few years now, my building has hosted a potluck lunch during Spring Break. It's an event we look forward to, despite the stress of late-night mid-week cooking, because even though we don't work in a very big building, it's rare that we have the opportunity to sit down and talk with one another, especially given that we represent four different units. And because the staff in the building is diverse, so is the food at the potluck. Today we had homemade samosas and empanadas, pernil (Puerto Rican roast pork), rice and beans, soft pretzels, Italian antipasto salad, cole slaw, pierogies, macaroni and cheese, and cream cheese flan. 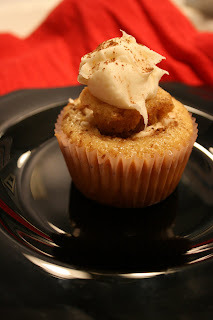 I decided that being spring break and all, I'd bring some of my more "adult" cupcakes: margarita (with tequila) and tiramisu (with Kahlua). So the potluck gave me an excuse to make cupcakes, and making cupcakes gave me an excuse to bake with Ian. Though he has the impetuousness of a typical three year old (I have to tell him more than once to "wait for me," which you'd think was oh so tiresome! ), he also takes this work very seriously. I learned last night that he's gotten quite proficient at pouring (he told me he practices this at school, with water); when I noticed how steadily he was holding the bottle, and how gradually he was tipping it, I let him measure the vanilla on his own, and he did it like a pro ... better, in fact, than I do myself sometimes. Ian is also a champion whisker. He loves watching the fats separate from the other liquids in the bowl, and then combining them to make smaller "blobs." 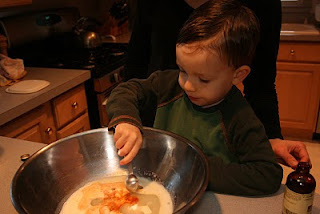 He also loves pouring in the dry ingredients, distributing them evenly throughout the bowl. I suspect that type-A gene is mine. Here are the final products. 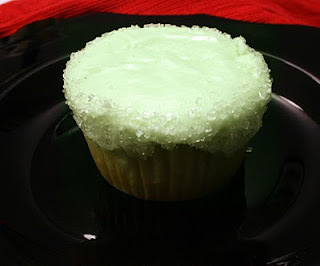 It's fun to rim the margarita ones in large sugar crystals, which resemble a salt-rimmed glass. And the tiramisu ones are an architectural feat, requiring a spoon to eat them. Both were a big hit at the potluck. I had to laugh, watching the conversation grow more and more boisterous and giddy, until someone said to me, "now, how much alcohol is in these things?" Well, now you know. Preheat oven to 350F. Fill a 12-cup muffin tin with liners. In a large bowl, mix together lime juice, lime zest, soy milk, oil , tequila, vanilla and sugar. Sift in flour, baking soda, baking powder and salt. Whisk until just combined. Divide evenly into muffin tins. Bake for 20-24 minutes, until a tester comes out clean and the cakes spring back when lightly pressed. Cool completely before frosting. Cream together butter/nonhydrogenated shortening (depending on whether you want the frosting vegan or not), soymilk, lime juice, tequila, and 2 cups of confectioners' sugar. Add in more sugar as needed to make frosting stiff, but spreadable. Spread on cupcakes and roll the edges in a small amount of coarse sugar (poured into a small bowl, so it's easy to direct it). Beat the margarine and cream cheese together well. Slowly mix in powdered sugar and beat until creamy. Add vanilla and beat until well combined. Mix vinegar and soy milk together and let sit to curdle for about 10 minutes. Whisk in wet ingredients . Sift in dry ingredients and whisk until no large lumps remain. Bake 20- 22 minutes at 350 in 12 cupcake liners. Let your cupcakes cool. Cut a little cone shape of the top of the cupcake, about 1 inch from the center, and remove it with a spoon. 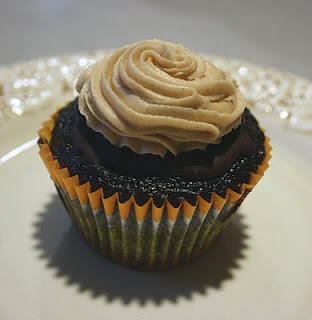 Pour about 1.5 tablespoons of Kahlua mixture into the divot you cut in your cupcake top and let it soak in. Fill the divot with icing. 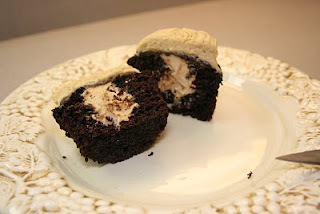 Dip the little cone shaped piece of cup cake you cut out in to the Kahlua mixture then place it on top of the icing. 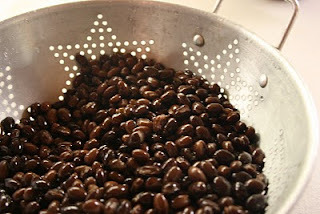 Put another little dollop of icing on top of that, then dust with cocoa, cinnamon, and add coffee beans and chocolate chips. It was almost 60 degrees here today. If the undergraduates had been on campus, they would have been sunning themselves in bikinis on the quad right outside my office window, playing guitar lazily, throwing a frisbee around, and wearing flip-flops. They weren't on campus, though, and as much as I like the undergraduate energy, it was blissfully quiet. I went for a long run at lunch, thought about gardens and farmer's markets, and sucked in as much of the warm air as I thought my lungs could hold. Spring is in the air (even our tomato plants, who sprouted today, agree), and though this dish will probably taste even better when we're right in the thick of CSA season, trying to figure out what to do with our boxed share of the week, it was a nice teaser for what's to come. 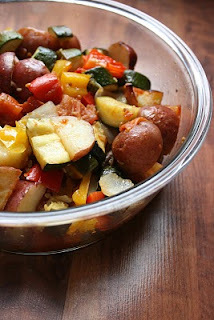 It's really just roasted vegetables, but it tastes like summer in a pan. And it's easy: I can throw it in the oven at night, forget about it for a while, and have it ready for the next day's dinner. It's also remarkably filling for a vegetarian dish. Preheat oven to 425. Cut veggies into uniform large-ish pieces and put onto a baking sheet. Add potatoes, halved. Scatter garlic cloves over vegetables. Pour oil over the whole thing and add very generous pinches of salt and pepper. Toss gently. Roast for about 45 minutes, stirring once, until veggies have crisped up around the edges and everything is all olive-oily-oozy. You can serve this with some fresh rosemary or parsley, fresh parmesan, and lemon zest sprinkled over it, or you can just gobble it down like I did. Ian has always been a musical child. From the time he was little, he would sing his way through an entire day; sometimes real songs, and sometimes songs with made-up words and melodies. I'm convinced that when I sing things to him he pays more attention to me than when I simply say them. This, on its own, wouldn't surprise me; though I wouldn't call us a "musical" family, we do have a shelf full of child-sized musical instruments (mostly percussion, which is useful when we have musical parades around the house), we have a piano (though I don't play it very often any more), we have a guitar and octave mandolin, and I've been singing to Ian since before he was born. Lately, though, Ian has been singing in Spanish. Not really in Spanish. Well, sometimes in Spanish. But more often in a made-up language that really does sound like Spanish. Complete with beautifully rolled "r"s.
I guess I shouldn't be too surprised about this, either; the children at Ian's school have Spanish once a week as a "special," but in addition to that, when we drop him off in the morning, before he goes to his regular classroom, Ian is in before-care with Señora Alice, the Spanish teacher, who speaks to the children in Spanish (or in a mix of languages) during the entire time they're with her. Still, I'm always caught off-guard when he starts making up Spanish words and songs. I love that he is learning the language, though, because I want Ian to have an appreciation for his Spanish heritage. Ian knows that his Grandpa Carlos was from Spain, and loved gardening and bread and singing (ever so slightly off key in his deep baritone voice) and black bean soup. My father didn't cook much in our house (that was women's work, you know), but when he took out the olive oil and potatoes and onion, I knew we were in for a treat. Though we never ate them for dinner, tortillas made a regular appearance as appetizers for dinner parties, and as cold lunches at the beach. Sometimes we ordered them at the Spanish restaurants in the Newark Ironbound section, where my father seemed to know all of the restaurant owners. My mother tried to make them, but they were always missing something, it seemed. I found this recipe a few years ago on Epicurious, and while it's a lot of work, it's become a staple in our house. Though it includes kale (that would never have happened in my parent's kitchen), it still reminds me of home, and my father, who would doubtless be very proud of his r-rolling Spanish-singing grandson. Peel potatoes and cut into 1/3-inch dice (2 1/4 cups). Heat oil in a 10-inch nonstick skillet over moderate heat until hot but not smoking, then reduce heat to moderately low and cook potatoes, onion, and 1 teaspoon salt, stirring occasionally, until potatoes are tender, about 20 minutes. Cook kale in a 4- to 6-quart pot of boiling salted water until wilted, 2 to 3 minutes. Drain in a colander and immediately transfer to a bowl of cold water to stop cooking. Drain again, squeezing handfuls of kale to extract excess moisture, then coarsely chop. 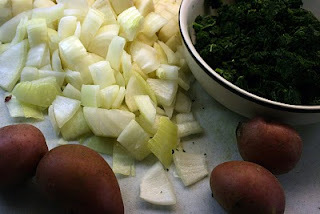 Add kale to potato mixture and cook, stirring occasionally, until kale is tender, about 5 minutes. 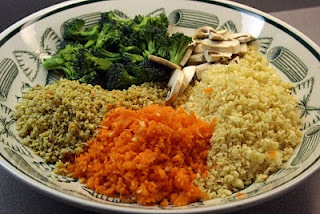 Drain vegetables in colander set over a bowl, reserving drained oil, and cool 10 minutes. 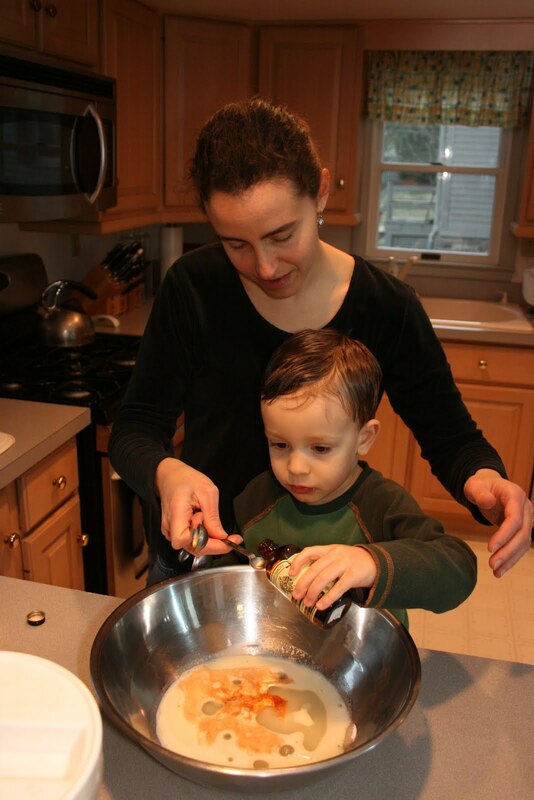 Lightly beat eggs in a large bowl, then stir in vegetables, 1 tablespoon drained oil, and remaining 1/2 teaspoon salt. Add 1 tablespoon drained oil to skillet, then add egg mixture and cook over low heat, covered, until sides are set but center is still loose, about 12 minutes. Remove from heat and let stand, covered, 15 minutes. Shake skillet gently to make sure tortilla is not sticking (if it is sticking, loosen with a heatproof plastic spatula). Slide tortilla onto a large flat plate, then invert skillet over tortilla and flip it back into skillet. Round off edge of tortilla with plastic spatula and cook over low heat, covered, 10 minutes more. Slide tortilla onto a plate and serve warm, cut into wedges. Perhaps I felt like I needed to compensate for the salad I made this weekend ... or perhaps it was just a response to the monsoon here in New Jersey, and an attempt to entertain Ian when it would not have been possible (never mind desirable) to go outside, even in full rain gear. Whatever it was, the spirit was weak. I needed to make cookies. 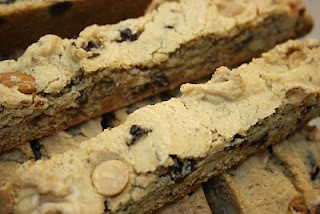 On my foodie tour of New York City back in January, I'd picked up a Compost Cookie from Momofuku Milk Bar. 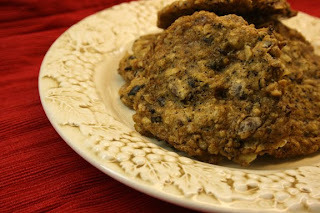 For those of you not in the know, the Compost Cookie has been sweeping the nation; it's something along the lines of Halloween in cookie form. While the thought of that cupcake from Butterlane still makes me swoon, I've also been thinking about that Momofuku cookie ever since, collecting ingredients (we don't generally have pretzels and chips around here), and waiting for the perfect moment to bake them. Apparently Kelly Ripa (I had never heard of her before a visit to my dentist the other day, where I got to watch morning TV) recently got her hands on the "secret" recipe and published it on their website. 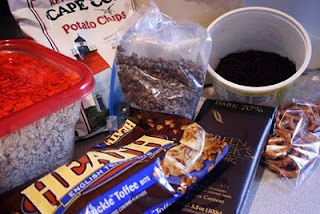 But there were no oats, and I knew that I wanted something more like a traditional oatmeal cookie base. Moreover, I did not want butterscotch chips (one of the few things I really don't like to bake with) polluting my cookies. After some hunting around, a found a recipe I thought might be worth trying. Ian helped by eating one of each of the mix-in ingredients before they went into the bowl, creaming butter and sugar, and licking the spoon at the end. He wasn't very interested in compost or cookies this weekend. That's OK, though, because it meant more for me. Luckily, I had an office full of colleagues who were willing to eat the leftovers. 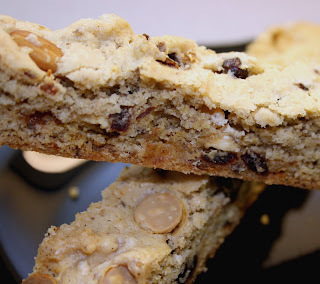 I know this: if these cookies are this good, I should probably not try to make Momfuku's "Crack Pie." Oh, well; back to healthy eating tomorrow. Preheat oven to 350º. In a large mixing bowl, cream together the creamables. 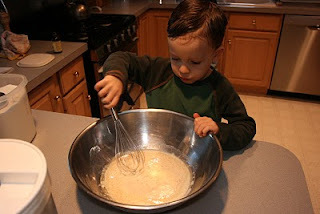 In a small bowl, combine the wet ingredients and whisk together until smooth. Add the combined wet ingredients to the creamables. Mix together until well incorporated. In a large mixing bowl, add the dry ingredients. Using a spatula, fold together until evenly distributed. Slowly add the dry ingredients to the combined creamables and wet ingredients. Mix until evenly combined. Chill dough for 2 hrs or overnight. Shape dough into balls–about 2 tablespoons each. Place dough balls about 2 inches apart on Silpat- or parchment paper-lined cookie sheets. Bake at 350º for 10-12 minutes or until golden brown. Remove the cookie sheets from the oven and let stand for 2 minutes. Cool on wire racks. Like anything having to do with healthy food, I found Raw Guy (who, in real life, calls himself the Raw Foodist) oddly fascinating. Hm, I thought. Eating nothing but raw? What would that be like? I read up on the new cafe he planned to open in Frenchtown, pored over recipes and diets online, trying to figure him out. Still, while I'm not giving up my stove any time soon (after all, the title of this blog is "half BAKED"), the idea of incorporating more raw foods into the American diet also appeals to me, because it reminds us to get back to our roots, to eat the things that our great-grandmother would recognize as food, rather than eating the things that come in plastic shrink wrap (we don't eat much of that sort of thing in our house anyway, but the point is still important). I happened upon Rawmazing's blog one day through a link at foodgawker (which just seems to have more inspiring photography and recipes than Tastespotting these days), and saw this salad. Though I'm not a big parsnip fan, it looked so bright and colorful that I thought it was worth a shot. I decided I would not pretend that it was stir fry, because ... well ... it's not. But as a salad, it's actually delicious. Rawmazing, even. Finely chop parsnips, carrots, and pine nuts and place in bowl. If you are using a food processor to do this, you will want to do each separately. 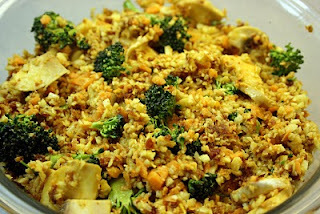 Combine with chopped broccoli and sliced mushrooms. 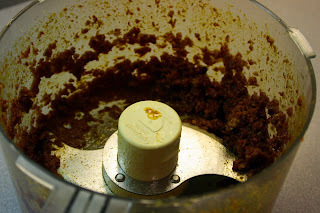 Combine all ingredients in food processor, process until well combined. Stir into the veggie mixture. Lick the spoon. Seriously. There's something about drinking tea, sipping something hot, that makes you take time to listen deeply, to notice the other person, to be fully present. And it seems to work better with tea than, say, my morning coffee, which, though I thorougly enjoy it, I sip (usually in my car on the way to work) only because it's too hot to gulp down in a single shot. A friend of mine who lives in Washington, DC, and whom I have gotten to know mostly via email, often writes things like "A Cup of Tea" or "Hot Cider" in her subject lines; I always imagine that email correspondence as a conversation that is leisurely, thoughtful, compassionate. She is a wise woman. The other day, after a difficult day at work and what seemed like the billionth pregnancy announcement this week, I was feeling particularly defeated, and wound up spilling my frustration to a mom who lives down the block. She wrote back, telling me that I'm not alone, that she had a story of her own to share, and that I should tell her whenever I had time for a cup of tea. Though she lives less than two minutes away by foot, and has a son Ian's age, I hardly know her; we seem to pass like ships in the night (she also has twin first graders, which makes household management and finding time for herself challenging, I suspect). But somehow we carved out time to get together, and she's coming over tomorrow night. I'm looking forward to it; my cabinet is full of caffeinated and decaffeinated options, and I made biscotti to go with the tea, because munching on biscotti will make our conversation go even more slowly. We will talk about motherhood, and children, and yoga, and writing, and ourselves. I plan to savor the talk, the tea, and the cookies. There's something to be said for this approach to deep listening. 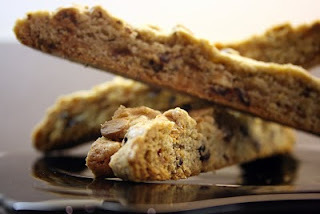 Perhaps if we had more tea and more biscotti in the world, there would be fewer hasty reactions, less poorly informed political decisions, more people who genuinely care about each other. So come, let me pour you a cup, too. Tell me, what kind do you drink? Preheat the oven to 350. Line a baking sheet with parchment. 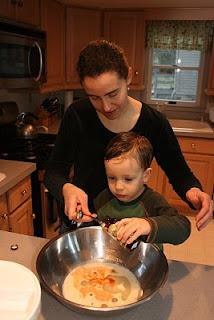 In a large mixing bowl, whisk almond milk and flax for about 30 seconds. Mix in orange zest, sugar, oil, and vanilla. Sift in flour, arrowroot, baking powder, allspice, and salt. Stir to combine and just before dough comes together, knead in chips and cranberries. The dough should be stiff (add flour if you need to). On the parchment, press the dough into a rectangle 12x4". Bake 26-28 minutes until lightly puffed and browned. Let cool 30 minutes. Preheat oven to 325. Slice log into 1/2 inch thick slices with a heavy sharp knife, in one motion (don't "saw" because your biscotti will crumble). Stand slices curved side up, about 1/2 inch apart on the baking sheet and bake 20-25 minutes, or until dry and toasted. Cool completely on a wire rack. I've written a few times about the snippets of spring we've seen recently here in Jersey. This weekend, though, it was like the fever broke. We took a long walk to Mine Brook Park this morning and skipped rocks into the gurgling water. I pulled on my sneakers and went for a five mile run, feeling at the end that if it hadn't been for the hamstring I've been trying to be gentle with, I could have easily run five more. Though I was making soup again, I spent the afternoon putting away winter: washing and folding snow pants and gaitors; collapsing the winter clothes drying rack, where wet mittens and muddy boots live; washing the towel near our back door that keeps the worst of the salt puddles from drying on the wood floor; sweeping out the tiny bits of driveway gravel that inevitably travel in with our winter gear. Unlike putting away Christmas, which makes the house seem bare and empty, putting away winter makes me feel like the house is open again. I teach a course called Intro to the Thesis. It meets on Wednesday mornings at 10 am. For those of you who don't remember college, that's early. Particulary for thinking about something as profound as deciding what you want to write your senior thesis about. So for the past two semesters, I've been doing the only responsible thing I can do: provide sugar. College students are also a fabulous group to test out new recipes, because they're just so willing to eat free food, no questions asked, and so few of them seem to have pesky nut or gluten allergies. Many of them are pleased to know that most of my experimental baked goods are vegan; they don't think it's weird or disgusting. Most university psychology departments already know the value of students as human subjects; I'd argue that the risk benefit ratio for participating in my experiments is much better than getting an experimental credit for General Psychology. 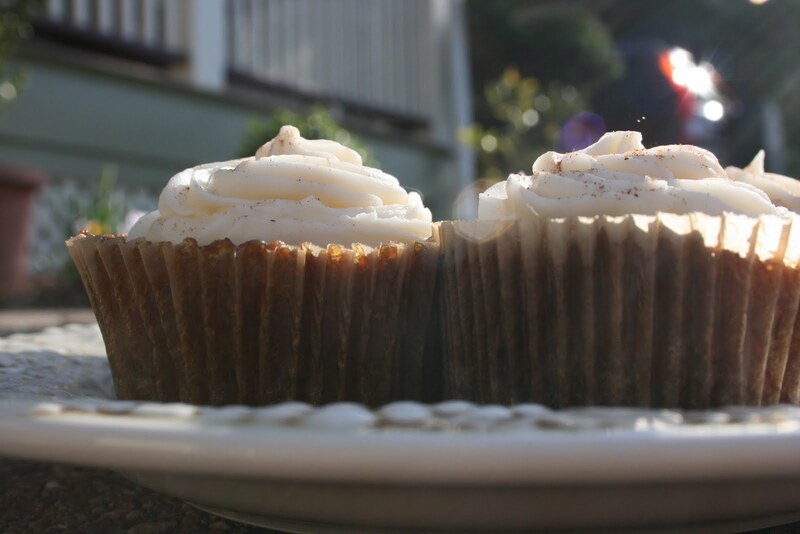 I always bring two kinds of cupcakes (one non-chocolate), so that there's bound to be something for everyone, except for the people who don't like cupcakes, and ... well, we won't talk about those people. I've been meaning for some time to try making filled cupcakes. Something about poking a hole into a perfectly domed cake, though, seems almost sacreligious. All sorts of things might happen: the cake might collapse, the hole might be too big, my finger might get stuck. This week, I decided to take the plunge. 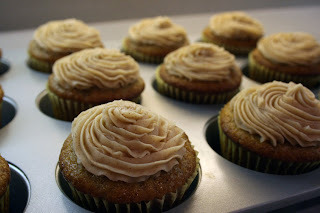 I knew that I was going to make banana cupcakes with honey-cinnamon frosting, an effort to replicate the amazing experience that N. and I had at Butterlane. I also thought I might want to make some combination of peanut butter and chocolate. And then it hit me: the Reese's cupcake! 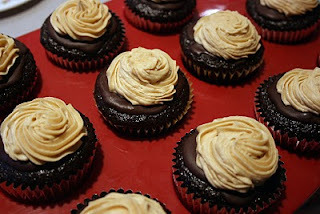 Chocolate cake, a subtle peanut butter filling, chocolate ganache topping to seal the hole, and peanut butter frosting. The cakes themselves rose beautifully, and were just the right balance of moist and firm. I poked my pinky inside them, making small caves, and used my trusty pastry filling bag to pipe the frosting into the center. It was like making a Hostess cupcake. 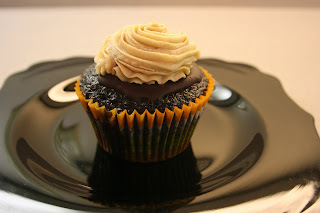 After letting them set for a bit, I spread on a thin layer of chocolate ganache, let that set, and finished with the final piping of peanut butter frosting. Ian let me cut his open so you can see what it looks like on the inside; keep in mind that this was towards the end of the day after they'd traveled to school and back, so the lovely mound of frosting had taken a hit. Still, I thought they were delicious. 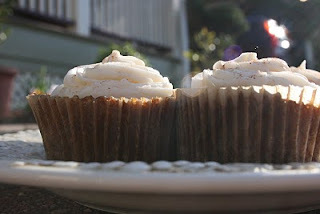 My colleague J. tells me that they're right up there with the tiramisu cupcakes as one of her favorites. Steve thought that they needed to be more chocolatey, but I'm not sure how that would be possible, unless one filled with peanut butter and frosted with chocolate? The banana cupcakes were also tasty and moist, though they didn't quite replicate the on-your-knees experience we had at Butterlane. I think I'm going back to the drawing board for that one. Nonetheless, the students were certainly appreciative. "Oh," said one, "Dean Levine, somehow I just knew you were going to bring cupcakes today." They're safer than spring break in Cancun, at least. Preheat oven to 350 and line muffin tin with liners. Whisk soy milk and vinegar in a large bowl and set aside for a few minutes to curdle. Add sugar, oil, and extracts, and beat until foamy. Sift in the dry ingredients and beat until no large lumps remain. Pour into liners, filling about 3/4 of the way. Bake 18-20 minutes (until toothpick comes out clean) and transfer to a rack to cool completely. Cream margarine/butter/shortening at medium speed until smooth. (Be patient about this; it's important to get it completely beaten into submission.) Add peanut butter and vanilla, and beat until very smooth, 2-3 minutes. Beat in sugar. 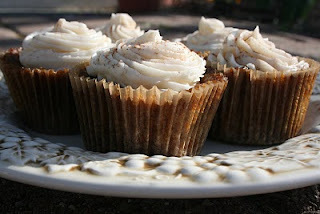 Mixture should be stiff; add milk a little at a time until the frosting is pale tan and fluffy. Fill cupcakes with a squirt of this and level off with a knife. After you've covered them a bit with ganache and let that set in the refrigerator, squirt some more on. Heat milk over medium heat until just about to simmer; add chocolate chips and stir until completely melted. Alternatively, stick both things in a small bowl in the microwave for about 30 seconds, remove and stir until incorporated. Set aside and cool 10 minutes, spread or drizzle on with a fork. Let the ganache set, preferably in the refrigerator, before you do anything else. When I was little, every few months we would drive to the Union City Cafeteria for Cuban food. My father spent many years of his life in Cuba, so in a way I suspect that it was like coming home for him when he couldn't return to the country; for me, it was a little slice of heaven, access to the world my father left behind when he immigrated to the U.S. I loved the big steam trays filled with platanos, yuca, arroz moro, and lechon asado. One of us always got a bowl of frijoles negros with a side of raw onions. For dessert, there was flan, or tocino de cielo, or churros with the thickest, richest chocolate you ever tasted. To this day, one of my favorite soups is black bean soup. It's easy, it's good for you, and it's comfort food: it reminds me of many blissful meals at the Union City Cafeteria, and my father, joking in Spanish with the tanned white-aproned men behind the steam trays. As an added benefit, according to research published in the Journal of Agriculture and Food Chemistry, black beans are as rich in antioxidant compounds as grapes and cranberries, fruits long considered antioxidant superstars. And--this matters for me--black beans are supposed to increase fertility.